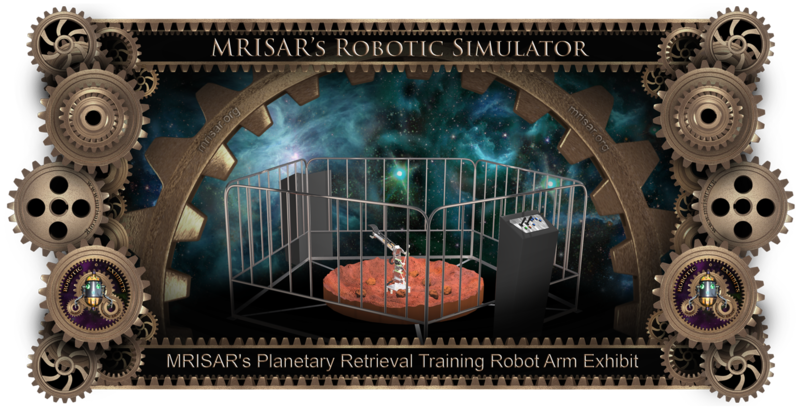 Simulator Planetary Retrieval Training Robot Arm Exhibit by MRISAR. Simulator Planetary Retrieval Training Robot Arm Exhibit by MRISAR. Exhibit cut away view. 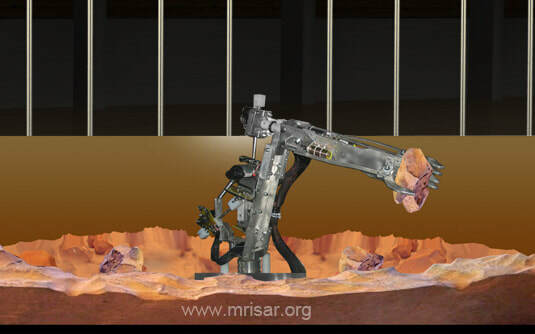 Basic description of the activity: The museum visitor uses a robot arm to collect a series of rock samples from a simulated alien terrain. The items reset to the terrain when the time is up. The arm has a camera mounted to it that sends images to a video screen, allowing you to operate it via telepresence. This exhibit relates to STEM education. Activity story: You are on a mission to another planet. To explore remote and dangerous areas of the planet, robots are being used. The robots are being operated by scientists such as yourself in an effort to collect samples, learn about the environment, how the planet developed, available resources and possible sources of life. The exhibit is a railed in dome containing a robotic arm that features nine degrees of freedom and is usable by a wide diversity of ages and skill levels. Inexperienced users will in most cases be able to pickup and maneuver objects in under a minute. The linkages on this arm and each of the many view-able components make this a very uniquely educational exhibit that relates to STEM. Super bright LEDs also accent the arm components and illuminate the artificial terrain to create more atmospheric quality. The goal of this exhibit is to familiarize the user with robot arm manipulation in a planetary exploration environment, the basic elements of the technology, and the relationship that even very complicated equipment has to the basis of “simple machines”. Technical basics: Five Finger Robot arm that measure approximately 39” long from the tip of the fingers to the base of the shoulder pivot assembly. Its movements are represented in the independent movement of each finger and thumb, as wrist CW-CCW, elbow up and down, shoulder up and down and shoulder CW-CCW. 120VAC 60 Cycles. The arm has pressure sensitive and end of travel limits, and can adapt to any arrangement of objects stacked in its path. 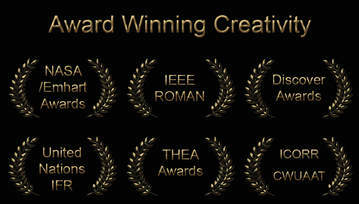 The arm is made of light weight 6061 Aluminum and specially designed with travel and force limits. 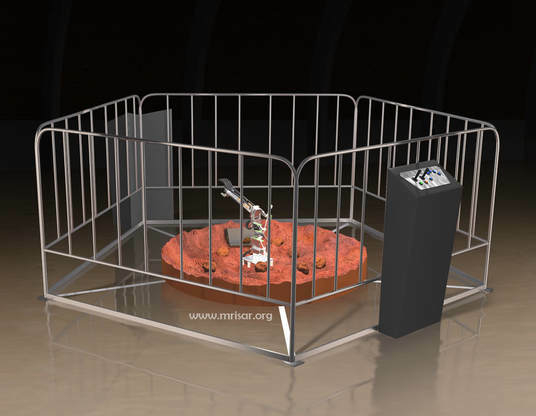 This exhibit comes complete with a railed in terrain, a 5 Finger Robot arm that measures approximately 39” long from the tip of the fingers to the base of the shoulder pivot assembly, control panel, power supply, a set of foam rock shapes for the arm activity, suggested maintenance information and schedule. Foot print is 5.6” x 5.6”. Additional Purchase Option "Spare parts kit": Set of four arm gear-motors (4) set of six replacement push switches, set of two replacement joysticks, four replacement long lever limit switches (4), four pin plunger switches (4), Replacement set of springs, a replacement set of fuses and a Basic set of maintenance and repair tools.